A sheet of 37mm stickers with areas above and below the image for wording. Once you've chosen your wording and added it, you can change the font and colour to suit you. We have chosen options which will complement the background colour of this sticker. 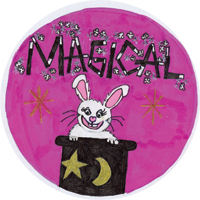 Magic Rabbit Trivia - This personalised design was inspired by a sticker design competition winner back in 2006. Below you can see the original image.